Zoe and Owen had been drawing on the white board. I didn't pay much attention to it until later. My heart glowed as I read the message: "Love the Word"....Ah....Zoe and Owen I love you. Here is our homemade pizza dough recipe. Above you see a blue bowl in the blue bowl is 4 1/2 tablespoons of active dry yeast in 2 cups of warm water, 2 tablespoons of sugar cane and 1/4 cup of olive oil. This mixture makes me feel like a mad scientist as we let it sit for 10 minutes and watch it bubble. With the kids we talk about how it's volcano or bubble city or whatever their little imaginations bring us. The next bowl brings us 5 cups of mixed flours. I like to use spelt, whole wheat and whatever else I have on hand rice, oat flour etc... What do you have hiding in your cupboards? Added to the mixture is 1 teaspoon of salt. Once the yeast has bubbled we mix it into the flour until it's sticky. Create a little mountain of flour in front of each eager child and have them roll the dough into the flour. They love this!!!! Trust me. In fact I get lots of satisfaction in rolling out the dough as myself. Adults can have fun too! Each child rolls out their own small piece of dough while I roll out the "mama" dough. When ready "mama" dough hugs her small ones (roll small ones into big one) and they become one big happy family. We put our dough family into the oven with the light on to let rise for 1 1/2 hours. Children then put fixings (pizzasauce, broccoli, peppers of course cheese!) bake in the oven at 250 until the bottom is golden brown. Eat, enjoy and be merry it's a pizza party! It was a warm fall day, mist hung low in the mountains, the lake reflecting it's white enchanting beauty. The recent rain allowed the nearby stream to flow with greater strength. We set out in our rubber boots and adventurous spirit to explore the bubbling brook. We jumped on rocks and balanced on logs. Zoe got a soaker and was a good sport about it. The forest was vibrant with life and death, moss clung to rocks shining bright green. Leaves still clung to their branches not ready to let go reminding me that often I have problems letting go. There was a glow in the forest that day, a magic experienced by the children and the adults. It is what we love to do, explore the wonder of nature, find adventure where adventure is to be had. My life is truly blessed. Wonderful experiences keep coming my way and with each experience I learn, learn, learn. Oh! How I love learning. This weekend I had the honour of meeting 5 wonderful women. You might have heard of them as The Funky Mamas. Their band consists of the violin, electric base, guitar, banjo, mandolin and beautiful voices. Their music is geared for young ears and enjoyed by the older folks alike. It's fun and makes you want to dance. These women met when their children were young. Together they were inspired to play together and eventually became a group. Throughout the years their group has evolved to publishing two CDs and putting on concerts. This weekend they had a concert here in Ottawa at St. Paul's University. It was a hit with 300 dancing fans. Way to go Mamas! I was lucky enough to spend the weekend with these fantastic musicians. What really stood out was that they are all sincere, down to earth women. I felt inspired to be around music. I listened with fascination as they jammed. I watched their fingers strumming cords creating sounds of joy and felt inspiration well within. Being around music all weekend got me inspired to delve into the world of music. I've always thought of myself as a non musician now I am ready to move through the block that my mind has created and redefine myself as a guitar player or maybe ukulele player. Let's see what evolves. The new year is coming and I will discover my inner musician. The Funky Mamas will back in May! Yeah! 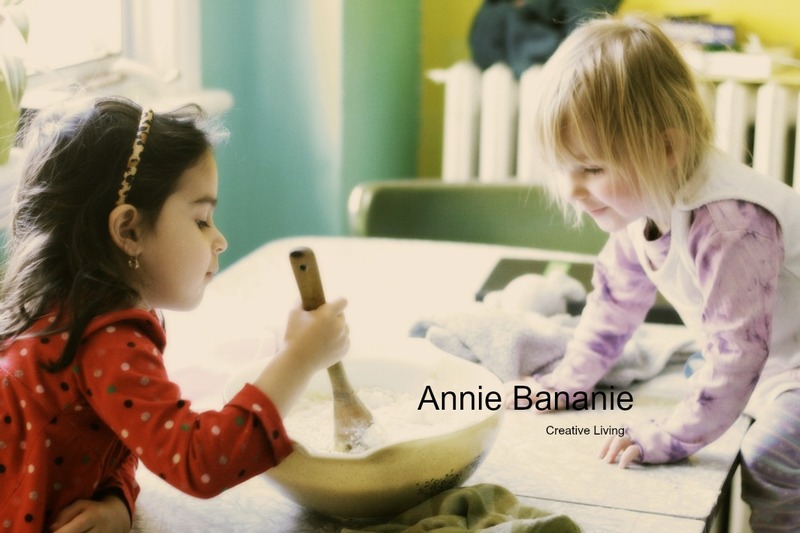 check out their website at: www.thefunkymams.com If you have young kids and don't have their Cd, it's well worth it. Their music is catchy and will make you want to dance, also it feels good to support our Canadian artists. Go Mamas Go! I get comfort from my daily rituals. My daily yoga practice keeps me grounded, my morning tea gives me comfort, my evening bath nurtures me, evening reading time with my kids makes me feel connected. Without these rituals I would feel scattered and ungrounded. Rituals are a daily necessity for well being. For these reasons our daycare children experience daily rituals. Lighting a candle before meals is a great example of this. The flame of a candle is warming and magical, it's light is a reflection of the light that lives within all of us. Before each snack and lunch we light a candle. "Little candle shining bright, share with us your golden light". We always show gratitude with blessings for our food. Please share with me your favorite rituals. The ones that nourish your soul and keep you steady on your feet. Leaves are falling, the earth is getting colder and the days are getting shorter. It's that time where we get warmth from hot tea, soups and cozy sweaters. In this time of change there is a feeling of going within and self introspection. In many traditions this time is reflected by opening a space for letting go of something unwanted. In the dark months of winter we work on this intention until Spring where we work on bringing something towards us. I've been thinking a lot about what I intend to work on for this cycle. As of late I have been feeling a strong pull towards being present with the little people in my life. When I am present to their emotional needs they are more grounded, things are calmer, they flow freely and more peacefully. So in this time of change I choose to let go of my stresses of the future and my stresses of the past and come into the moment and give birth to a new me in the present. I understand that when I am present to others and myself it is a true gift of love. There is a pulse within. same infinite pulse that surrounds us all. The air is getting cooler and the urge to bake has been strong. It's pumpkin season and I have been using these great big orange fruits to bake these wonderful, yummy muffins for the little ones. This recipe was given to me by my dear friend Michelle which was passed on from her grandmother. If you can recall my summer post about swimming you know that I love the act of jumping into a lake. Well it's the beginning of October and I am still relishing the lake water against my skin. At this time of year the water is refreshingly, shockingly cold. I love the feeling of aliveness it brings to my being. The ritual of running towards the water and jumping makes me feel alive. As I run and jump in, I let go of my fears and allow the sensations to permeate through me. As I walk out of the air which was cool now seems warm and my extremities tingle with warmth as blood rushes to my extremities. Between keeping up with daycare, nurture my own children, teaching yoga and my other endeavors I have managed to felt about 10 balls. Not the 15 I wanted but hey nobody's perfect. Nature provides us with many things such as food, air to breath and also craft supplies!!! 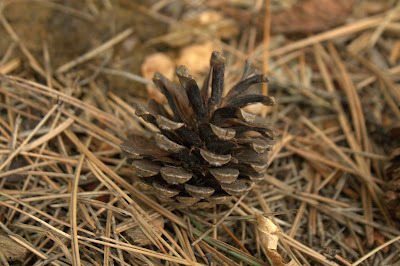 Last week we went on a nature walk and under a great pine tree found pine cones nestled onto pine needles. 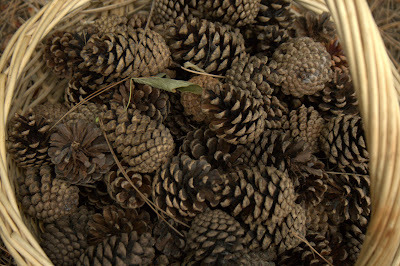 We soon collected a basket, gave thanks to mother Earth and promised to make good use of them. Our first project has been getting out the paint brushes and paints to paint our tree like friends. A few days later I cut some lengths of felt and glued them to our decorative treasures. They now hang from our seasonal wreath which hangs over our kitchen table. When the children noticed their pieces of art hanging above they exclaimed in excitement and were very proud!